The Botanique @ Bartley is fully sold out. If you missed getting a unit there, and like the Bidadari estate neighbourhood, you might want to consider the Addition launch at Potong Pasir MRT station, on the other side of Bidadari. The best part thing about this project, is that it is on freehold tenure. On top of that, it is only 3 minutes walk from an MRT station, and most of that is sheltered. That’s because the Addition condo is just opposite Poiz Centre, a neighbourhood mall that connects directly to Potong Pasir MRT station. So like Botanique, this is a city fringe location as well. The other attraction about this place, is that it is within a couple of doors from St Andrews School, both the junior and senior sections, and well within the all-important 1km radius. This should appeal to families with young boys. Perhaps that is why the Addition does not have one bedders, only 2 and 3 bedroom units. The flip side is that this is basically a no-frills, smallish project. With only 26 units on a land area of 9,667 sq ft, there are not many facilities. It depends on what is important to you. Because other than the smallness of the project accompanied by a small pool, it has almost everything else. Including shops opposite it at Poiz Centre, a Fairprice supermarket and bank behind that, and lots of eating outlets around. Ranging from a hawker centre and old coffeeshops, to trendy joints across the road at The Venue Shoppes. Besides that, the price is pretty attractive too. The developer, Oxley Holdings, is pricing this project to sell out quickly. Brand new freehold units here start at $1.08M for a 2 bedder, and $1.385M for a 3 bedder. That works out to an average of $1,7xx to $1,8xx PSF, which is comparable to the pricing for 99 year leasehold launches nearby such as at Park Colonial, and cheaper than for the upcoming Woodleigh Residences. 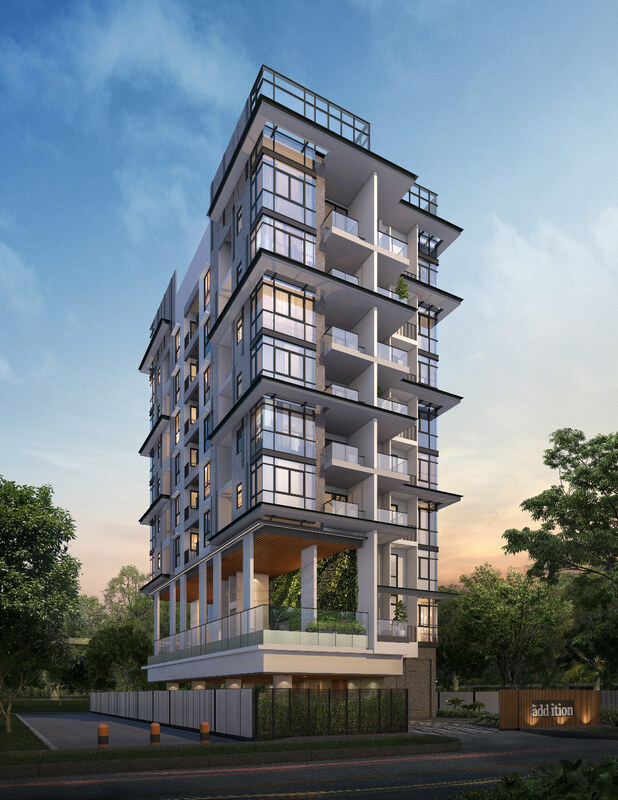 Park Colonial has sold over 55% of its units in under 2 months from its 5th July 2018 launch date, so there is obviously demand in this location at this pricing level. It seems like at this pricing level, the Addition condo could be a bargain, despite its lack of facilities. If you think so, and would like to view the Addition condo showflat, just jump over to the website and drop a line to make an appointment. The floor plan brochure is ready, so we will send that to you as well. Latest Update: A large chunk of this project has been sold, and there are not many units left. So don’t delay if you think you might want to take a look at this project before it sells out. This entry was posted in Botanique at Bartley | Botanique @ Bartley and tagged botanique bartley, new bartley condo, new condo bartley met on July 28, 2018 by Reviewer.